Dimensions (HxWxD): 3.75" x 1.65" x 1.33"
This magnificent 3.75 inch long Water Clear 8 Sided Smoky Quartz healing wand, weighing .38 lb. or 172 gramswas created by Lawrence Stoller, critically-acclaimed artist, craftsman & creator of magnificent works of art created in partnership with Nature & Light. "'Creative genius' is a term I have seldom used in my life," says William E. Boyajian, President of the Geological Institute of America. "But I use it now to describe Lawrence Stoller, for these are the words that typify both his passion and his ability to preserve and protect beautiful crystals of nature -- and thereby transform them into creations that inspire countless thousands of people around the world." Lawrence fashioned this beautiful smoky healing crystal wand with two large flat facets and six thinner facets of equal width on the shaft. The quality of the workmanship is unsurpassed, and the quality of the water clear smoky quartz is definitely AAA+ collector grade material. 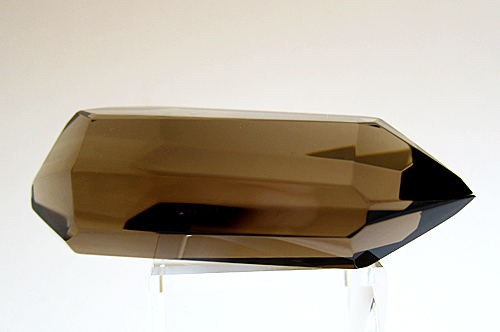 This gorgeous Smoky Quartz Healing Wand has been cut and polished to create a unique geometrical form resembling an arrowhead, a stealth fighter jet and a naturally occurring quartz point. This beautiful artistic creation has a neo-primitive high-tech beauty that is truly 21st Century! Lawrence's work is in worldwide museums & collections. He has created a magnificent centerpiece for American Express's Eleven Tears World Trade Center Memorial. He thinks of crystals as "frozen light" and indeed this Smoky Quartz displays soft & sweeping bands of light & dark within the stone itself. This wand comes with its own pouch, which you can see in the photo on this page below. In 'test driving' this wand, both of us felt its energy signature to be very smooth, healing & nurturing, calling forth hidden aspects of ourselves which needed to be brought to the light. This healing wand is suitable for use in energy treatments, shamanic practices, Reiki sessions and crystal healings, and is as powerful and versatile as the healing wands designed by the legendary IBM scientist and crystal healer Marcel Vogel. This is not a Vogel healing wand, but rather a work of art created with love & respect for the natural world. The way in which it was created is reminiscent of the methodology of indigenous artists from around the world, where in creating a work of art, they first 'listen' to the piece of stone, or wood, or ivory, to 'hear' & see the form that wants to emerge. It is a co-creation with Nature. 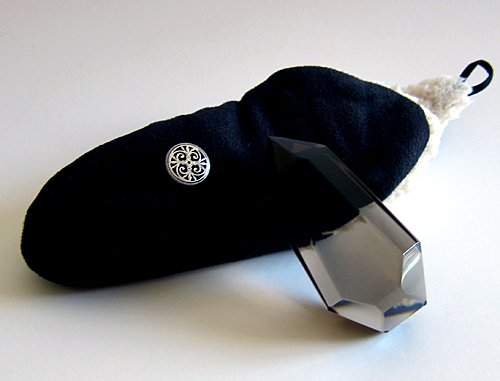 Marcel Vogel believed that a healing crystal cut with 8 sides has a very special energy signature. 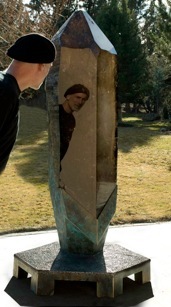 "The eight sided crystal moves beyond the physcial body," Vogel explains in the manuscript of his previously unpublished book, The Marriage of Science and Metaphysics, soon to be published by Satya Center under agreement with the heirs of Marcel Vogel. "It is designed to remove multiple layers of pattern which do not come out with a four or six-sided crystal. 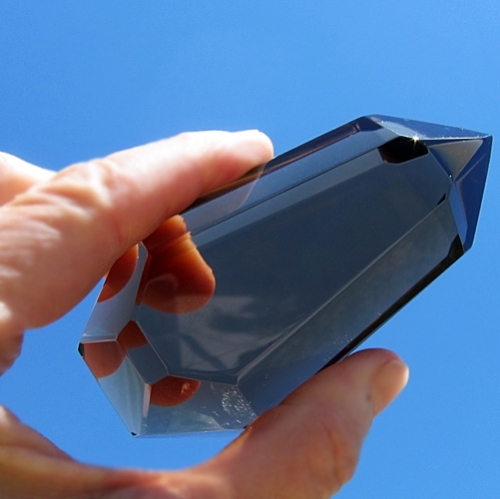 The eight-sided crystal has even sharper angles on the tips. The rate of penetration is even higher. And the precision you must work with is even more exact. With an eight-sided crystal you can link with the subtle bodies of a person, their programming, and with the total intention of that person to be free and move on their path. It can be used for difficulties involving deep shock, severe trauma, difficult birth experiences, et cetera, touching down into the soul level. . .They are serious instruments to be used for healing and therapy and for a higher purpose, to serve mankind." Smoky quartz has been a favorite healing stone of shamanistic practitioners around the world for thousands of years and is one of our favorite healing & meditation stones. It is an aid in gently releasing blockages caused by negative energy patterns in the emotional body. Smoky quartz has been used as an aid in meditation, for energy healing, and to create a protective barrier of energy around the holder, helping the user to ground their energy and to clear the mind. Our experience in working with smoky quartz both for ourselves in meditation, self treatment & with clients on the Reiki table is one of supreme protection, slow and deep healing, and gentle awakening of spirit. 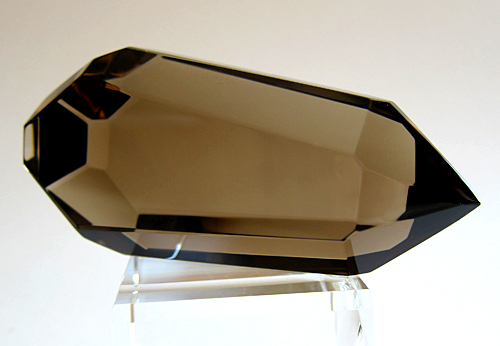 Smoky quartz guards our house, it is a companion to the sick and is a deeply beneficial gift from the Great Mother. 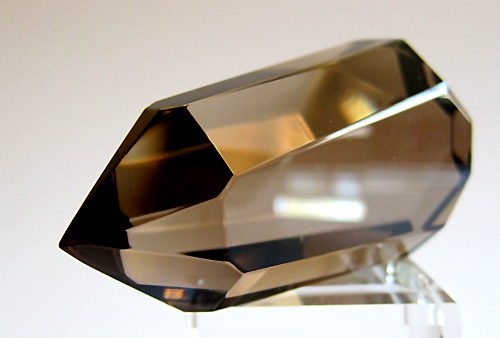 Smoky quartz crystals are best used over time to gently remove emotional and mental blockages. Smoky quartz also promotes grounded and centered forms of consciousness expansion. Smoky quartz works slowly and thoroughly to relieve imbalances in the physical and etheric bodies, with special emphasis on the solar plexus and its associated chakra, the third or Manipura chakra associated with personal power and vital energy. And it works on the hands and feet. Smoky quartz can, over time, help to balance the flow of vital energy throughout the physical and etheric bodies, and aids in the development of a healthy, fully functioning chakra system. Mineralogists say there may be more than one cause for the gray to brown to black color range of this very popular form of quartz crystal, ranging from sodium to other minerals in the crystal, including: the presence of trivalent titanium; the presence of carbon compounds; or the presence of sodium. Most mainstream mineralogists believe that the characteristic dark brown to black color of smoky quartz is produced when clear quartz is exposed to natural radiation emanating from radioactive rocks in the same geological formation where the quartz crystals form and grow. The current scientific hypothesis is that when clear quartz is exposed to radiation, the radiation alters the oxidation states of mineral impurities found within the quartz structure, resulting in smoky quartz. This wand comes with its own FREE handmade pouch constructed of 100% polyester fleece and micro bonded suede that has the look and feel of real sheepskin. They are designed for a snug fit and come with extra padding to protect delicate tips and points. Read more about smoky quartz crystals and other types of crystals at the SatyaCenter.com crystals homepage. We know you will use this powerful crystal with loving care and respect its long evolutionary journey deep in the Earth, which has developed its unique metaphysical properties and beautiful appearance. It is a gift from Mother Earth in partnership with the visionary talent of Lawrence Stoller to you. Note: Weight above is shipping weight. Net Weight is 6.07 oz., 172 grams, or .38 lb.